Discussion in 'Sako Rimfires and Small Action Rifles' started by sakop94, Dec 18, 2009. As I understand it, Biathlon rules require that the rifle be manually operated. 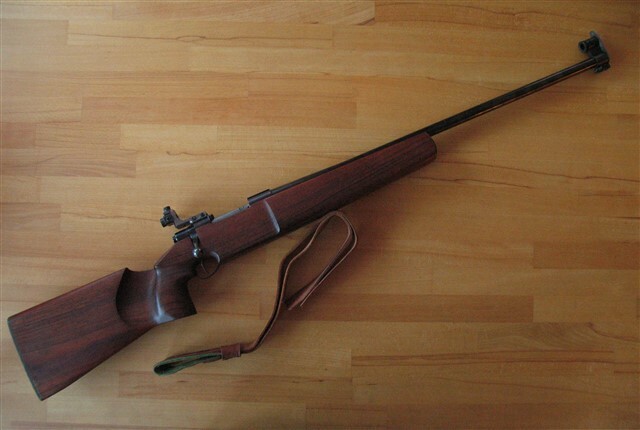 But modern Biathlon rifles have been highly refined to use a "flick bolt", a sort of straight pull bolt action which can be operated much more rapidly than a turnbolt like the Sako Model 78. Also, the "flick bolt's" operation doesn't require it be moved from the aimed position, thus making succeeding shots much more rapid than with a turn bolt. Thus, fine rifle that it is, the Sako 78 Biathlon is hopelessly obsolete as a Biathlon competition rifle. To my knowledge, Sako isn't trying to make a Biathlon rifle presently. There is a Russian-made model which dominates the field. Biathlon used to be shot with turnbolt centerfire rifles. Sako made a centerfire biathlon rifle in .243. The Finnish military also built biathlon rifles out of military Mosin Nagant actions. These rifles resemble the m/28-76 target rifles that were imported a few years ago. I have a photo of a.243 Sako biathlon rifle in one of my reference books; I'll scan it and post it if I can find it. The Finnish word for biathlon is "ampumahiihto," literally "shooting-skiing." Word monster Ampumahiihtokivääri. This model was made for Sapporo Olympics 1972. Earlier model with lyman sigts. Both of these were L579 -models. L57 models are wery rare. I have seen one, but it was rebarreled.